F.C. 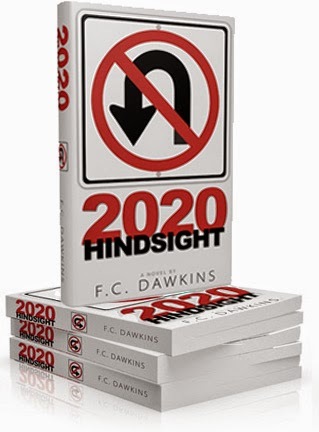 Dawkins has created a masterfully chilling world in 2020 Hindsight, partially due to the fact that in some ways, the book straddles the line of even counting as sci-fi in the first place. There are no far-flung futures and hovercars, no lasers and killer robots in Dawkins' world. Much like some of the classical authors of the genre, he modifies a world that's less than a decade removed from our own with a single super-science tweak: a scientist has discovered the key to halting aging in a process called ELP, effectively granting those who undergo the procedure eternal life. The remaining aspects of the setting in the book are hauntingly plausible: the long-anticipated collapse of infrastructure via overconsumption and over-reliance on fossil fuels has finally come to pass, leading to the large-scale destruction of the US and Canada as world powers. Most major metropolitan areas are now ruled by gangs, and the few remaining pockets of stable existence involve people living a pre-industrial existence of farming and hunting. Meanwhile, in Arizona, Gerry Wallace (the inventor of ELP) lives in the epicentre of Nirodha, a utopian city with exclusive access to the life-extending procedure. Unfortunately, paramilitary powers are mounting within the city, using paranoia and misinformation to aggregate control and risking the idyllic world that Gerry and his colleagues have worked so hard to build. Meanwhile, Tom (Gerry's estranged brother) is making the cross-country trek to try and reunite with his sibling, believing Gerry's life to be in imminent danger. Dawkins' background is in business and economics, and it shows here in the best way. The utter failure of civilization in 2020 Hindsight is meticulously thought out, to the point where it becomes viscerally uncomfortable how easily this could occur. The same goes for the reorganization of world powers in response to the power vacuum, and the attempts of the more unsavoury groups to try and assume control by using ELP as both the justification (“everyone wants what we have”) and the carrot at the end of the stick (“prove your loyalty to us, you get to live forever”) for its operations. At the same time, Dawkins isn't afraid to confront the philosophical, emotional, and economic implications of immortality, eventually questioning whether or not it's worth the very real costs that come with it. At times, the bald-faced nature of the conversations surrounding these ideas risk turning the book into a thought experiment rather than a story, but the genuine relationships and likeable characters help to keep the book grounded. What ultimately results is some of the smartest, most thought-provoking speculative sci-fi in the past few years. Definitely grab a copy of this one. Vincent Smith is a taoist, aspiring writer, and dyed-in-the-wool psychology geek at the University of Guelph. You can find his writing on video games, comics, movies, and all things geek over at The Rogue's Gallery. Check out his FB page, Vincent Smith: Writer, Scholar, Gentleman, for more musings from the dark corners of the internet. Plus the occasional cat photo.